(SEE AVAILABILITY ABOVE FOR EXTENDED DELIVERY) - DeROM Dynamic Range of Motion Splints - Elbow Splint, Left, Size D, bicep circumference 12+" - DeROM Dynamic Range of Motion Splints - New & improved with replacement softgoods & same reliable hinge! Single patient splints designed to address joint stiffness & soft tissue contractures. Low load - prolonged stretch splints ermanently stretch contracted tissues to restore range of motion. 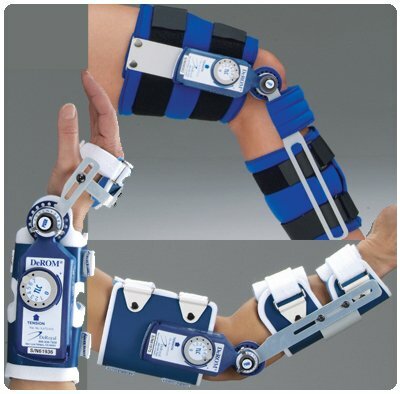 DeROM offers flexion or extension assist in one splint.Wire - foam cuffs on the wrist, elbow & ankle allow for custom fitting without the use of heat or tools. Vel - foam cuffs on the knee ensure patient comfort & compliance. The DeROM Wrist device features ulnar/radial deviation adjustments. Latex free. - Rolyan products are internationally licensed & manufactured for home & clinical use. Most of their products offer a lifetime warranty.